Unique Moments Photography from Gig Harbor Wa had the distinct honor to photograph Dani and Aaron’s wedding at the Feather Ballroom in Snohomish Washington 98290. When Dani told us the wedding was going to be on April fools day (04-01) , we knew this was going to be a ton of fun. Everything about this wedding was perfect. The families were awesome, the bridal party was a ton of fun, the venue was simply outstanding, but most of all, Dani and Aaron really melted our hearts. They were very much in love and everything they planned was all about Attitude and a deep appreciation for family and friends. When we first met them, the took us to gas works park for their engagement session. We had never been there and a bottle of wine was brought to really make the engagement session special. Pictures were off the charts good ( see the blog ) and we knew Dani was going to be nothing short of spectacular for the wedding day. We could barely wait for the wedding. The day of the wedding started off with a trip to the salon to get hair and her make up put on. We grabbed a few shots at the salons and headed for the feather ballroom. Dani arrived and started to get dressed while the guys were getting photographed and Aaron was anxiously waiting for Dani to arrive for the first look. Then, all the magic started. 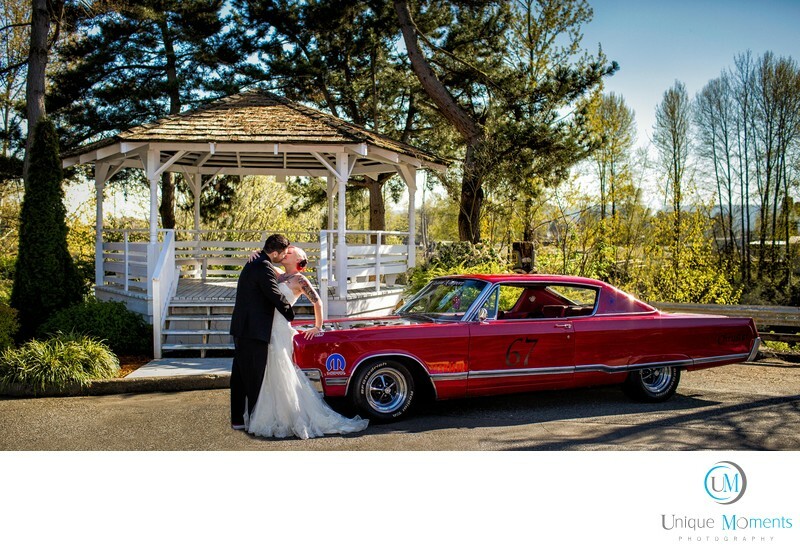 Their first look was in the center of town at the Gazebo overlooking the Snohomish River. Aaron and Dani had a wonderful and emotional first look. Their friends did not disappoint. Aaron’s friend showed up with a 1967 Chrysler and the bridal party pictures process swung into full gear. Trust us, it was not hard to get everyone to smile and have a great time. What a super cool idea. The Red Classic car fit right in with the Red that were Dani’s colors for the wedding. Everything was just perfect. Then it was Back to The Feather ballroom for a lovely ceremony and family pictures that followed the ceremony. Dinner was served and we must add that the food at the Feather Ballroom was outstanding. The staff was very accommodating to everyone and Dani’s wedding Coordinator, Marjorie Johnson (253-249-9407 ) did an outstanding Job keeping everyone on schedule. Reception activities included speeches by the best man, maid of honor and both fathers also added some words of advice for the bride and groom. Dani and Aaron had their first dance an closed out the evening with some wild and really good Karaoke music. The day was simply perfect. We were tickled to be part of this one. Best April Fools Day ever !! Location: 801 1st St, Snohomish, WA 98290.